For years, the rugged coast ranges isolated Humboldt County from the rest of California. Roads were rough and often impassable during poor weather. The 100 mile stage trip from Willits to Eureka took 2 days. The more reliable access by sea could also be uncomfortable and dangerous. Behind the "Redwood Curtain," Humboldtians developed a self-reliance and independent attitude still evident today. In 1914, the Northwestern Pacific Railroad completed its link to Humboldt County. Arrival of the first trains was greeted with great celebration. The railroad promoted its Redwood Empire Route to a land offering "every variation of pleasure and recreation, every phase of beauty that the world affords, every charm of climate that the town-weary may seek." Trains made a point of stopping at favorite fishing spots. About the same time, the automobile was growing in importance. As part of the new California highway system, old dirt roads were paved and became the Redwood Highway - later US 101. Humboldt promoters extolled the area's tourist attractions, its abundant hunting and fishing, adventuresome camping, the magnificent redwoods and a dramatic coastline. Along the highway, tourist oriented businesses flourished: hotels and "auto courts", campgrounds, restaurants, service stations and garages, souvenir shops, and roadside "attractions" such as The Stump House and drive-thru trees. 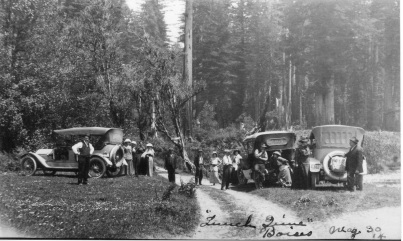 The Eureka Inn, Benbow Inn, Sequoia Park and other local landmarks were developed largely to draw tourists. Gradually the economic importance of redwoods as a tourist attraction rivaled their value as lumber. The Save the Redwoods League, formed in 1918, bought up tracts of redwoods to grant to the new state parks system. In 1967, the Redwood National Park was established. Films also brought Humboldt's natural beauty to the world. From silent movies to the present, film companies have used scenic Humboldt locations. A popular local novel, Valley of the Giants, was filmed here in silent and sound versions. Local redwoods have served as the ancient forests of Jurassic Park and the Ewoks' moon in Star Wars: Return of the Jedi. Humboldt beaches have been frequently filmed, and the Victorian village of Ferndale has appeared in several films including The Majestic and Outbreak.